Source. Click here to enlarge. This graph shows the difference between the 10-year and 2-year yields on Treasuries. 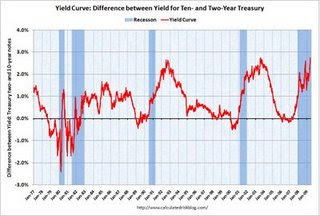 In general, a steep yield curve--that is, a high value of this variable--is a positive indicator of future economic growth. In many ways, however, this is an unusual downturn, so it is not entirely clear to what extent historical relationships are a useful guide going forward.